Creative Arts School aims to be the finest daycare and preschool in Bethesda, providing your child with a unique curriculum that encourages them to express themselves and develop their imaginations. To learn more about our Bethesda preschool and daycare services, contact us today! While our summer program at Creative Learning may not be a full blown summer camp like others, the program has many of the same features that you will find in a typical summer camp setting. We take a lot of pride in providing our summer program attendees with an experience that’s beneficial and fun, and while some parents are well aware of all the benefits that a child can enjoy from attending summer camp, others may not be so familiar. 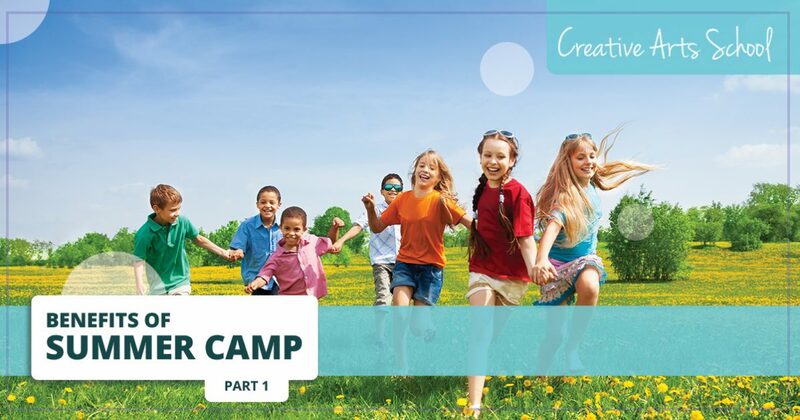 With this in mind, in part one of our blog series, we’ll look at a handful of examples of how attending summer camp can be beneficial for your child, both in the short term and as they grow up. Here and now, children are more connected to technology than any previous generation. Whether if they’re playing video games on a console, watching a movie on their tablet or talking to friends on a mobile device, children today have grown up with technology and only know of a life that’s filled with devices. While engaging with technology is a common and in some ways necessary part of living in current times, it’s also healthy to spend some time away from their devices and exploring other aspects of what life has to offer. By sending your child to a summer program like the one we offer here at Creative Arts, you will be encouraging your child to do just that. If they instead spent time at home over the summer, the chances of them disconnecting from their devices are far lower, as they are simply at home with no specific agenda for the day. The summer program here at Creative Arts is one that has a wide variety of activities, and it’s designed to not only keep your child engaged throughout the day, it’s also designed to help them enjoy the variety that the summer holidays can bring. If your child is the outdoorsy type, our summer program features a variety of outdoor activities, with games like basketball, tennis, soccer and more. Summer is a great time to be outdoors, and in spending time playing sports outdoors, your child won’t even notice that they may be away from their devices. Coupling this with our field trips and our creative activities like painting and sculpting, and your child will spend their summer not only enjoying the weather, but spending time doing far more than simply sitting around on their device. Summer vacation is a time to enjoy the outdoors and spend time with friends, but it’s also a time for making new friendships as well. When you send your child to summer camp or a summer program like the one we offer here in Bethesda, the chances of them making new friends are high. There may be students in our summer program here that don’t attend classes during the school year, and with that in mind, your child may get the opportunity to make friends with other children that they would not have met had they not attended our summer program. The fun experiences that kids have at summer camp can become lifelong memories, and the friends that they make along the way can become lifelong friends, as well. Sending your child to summer camp can help them make new friends, helping them have a truly enjoyable summer vacation experience. Those are just a few benefits that your child can experience while attending summer camp. Whether if you have a busy schedule this summer and cannot dedicated your full time to watching your children, or your children are seeking some fun and excitement this summer, the summer program from kids here at Creative Arts in Bethesda is a great way to provide your child with a fun and educational summer experience. We will continue this in part two of our blog series, but until then, to learn more about our Bethesda summer camp, contact us today!